SFC Farmers' Market East is Moving! The SFC Farmers' Market East, established last year at Hwy. 183 and 51st Street (and still operating there Tuesday mornings in February), will be moving! Beginning March 5th, the East Market will be relocated to MLK and Miriam Street, near M Station, and the time will change to 3pm to 7pm Tuesdays! We're excited to begin serving the community at this new location, as it will be even closer to the SFC's new home on MLK (opening in June). To celebrate the move, on March 5th the first 25 shoppers to bring a friend (meaning the first 50 shoppers) each get $5 in market tokens to spend. Also, everyone who comes to our grand opening can enter to win a market basket of goodies (you must be present to win, or be willing to come back to pick up in case of perishables). We hope to see you there! We have a variety of stories to showcase what happens when you mix a group of aspiring gardeners and two great teachers in a community garden. Click here to read this story and more from Citizen Gardener! starts 2013 with a bang! 7 six-week classes have begun since January 15! Partner sites include AISD schools, UT Elementary School, YMCA and People’s Community Clinic. This morning I had a chance to sit in on a class making Baked Sweet Potato Fries from our cookbook. The sweet potatoes were purchased from Johnson’s Backyard Garden, one of our vendors at the SFC Farmers’ Markets. In each six-week class series, we use market-fresh produce to reinforce the mantra of Grow.Share.Prepare. So what do you say? Are you ready to do some preparing? Click here to view the recipe to get you started! The 83rd Texas Legislative session began on January 8th, 2013 and will wrap up on May 27th. During this session, the Texas Legislature will be considering many bills that affect our local food system. Texas is a leading agricultural state, and we should take advantage of the opportunity to continue leading in this changing industry by supporting policies that create jobs, retain wealth in our communities, and improve people’s health. Click here to read our full post on this year's session and our current policy priorities. 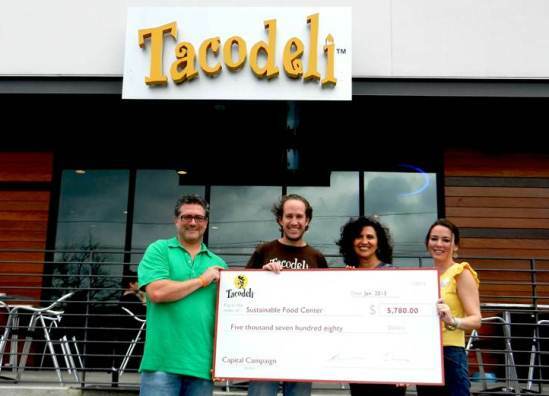 Roberto Espinosa and Eric Wilkerson of Tacodeli present Ronda Rutledge and Susan Leibrock with their donation raised through The Breadwinners, a group of food and beverage-industry supporters helping to complete SFC’s Capital Campaign! SFC will be participating in the first annual Amplify Austin, a community-wide day of online philanthropy with the goal of raising $1 million in 24 hours. Help us out by spreading the word about the campaign, donating anytime between 7pm on March 4 to 7pm on March 5, and sharing your love of SFC! Facebook and Tweet #AmplifyATX to show your support. Keep watching our SFC Facebook page and SFC Local on twitter for more details! How is Greenling helping to raise funds for SFC’s new teaching & community garden through February 28? Find out here! Mecca Gym and Spa is raising funds to support SFC's mission each month of 2013! In February Mecca is donating 5% of all skincare products, and in March 10% of all smoothies sold.